In the UK over 70% of people want to learn a foreign language. Most are looking to improve their knowledge of other cultures, as well as give them a boost in their career. The problem is, learning a language is notoriously difficult. Busuu aims to help. 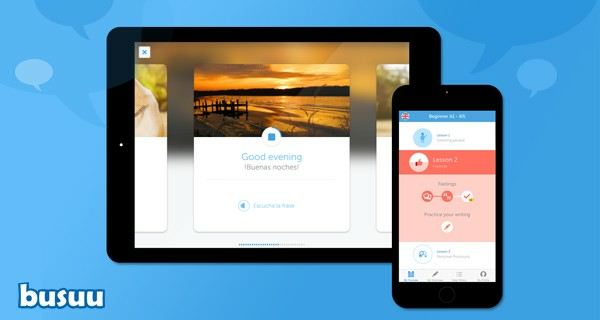 An online collaborative platform, Busuu links up native speakers of different languages. Every student becomes a teacher, getting support from in-house educational experts who set and monitor content and material. The courses include writing, reading, listening and speaking exercises, and you can practise alongside and learn from peers in (currently) 12 languages. Over 50 million students are using Busuu through the web and the Busuu app, and the company is adding 100,000 more every day. For English learners, they’re offering the community the world’s first video course that links up with native speakers. A collaboration with Pearson also gives these students a recognised gSET certificate at the end of their course. Access to the basic courses, material and apps is free, with Busuu also offering premium audio-visual material. Their goal is to make language learning easy and effective, teaching vocabulary that is geared towards everyday situations. The innovative use of technology has won Busuu awards including ‘Best Education Startup in Europe’ 2014 from EdTech Europe. With a well-designed interface, curated course material and integrated chat platforms, Busuu is a solution that helps us all better communicate with the world around us. Sign-up is easy and free, and you’ll get to know people from all over. Try it out, and learn a new language on the go.